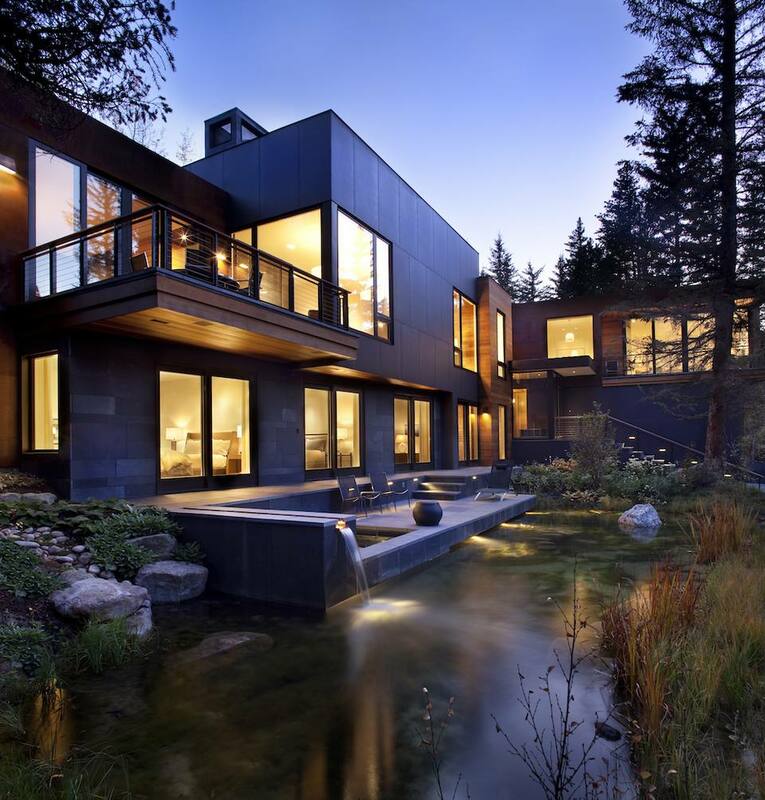 Located in picturesque Vail, Colorado is a stunning vacation retreat by New York interior designer, Alan Tanksley. Known for creating warm and approachable environments, Tanksley has designed this Colorado home in stark contrast to typical mountain retreats in the area. Among brush and soaring trees, rustic design has been abandoned for a contemporary home that marries clean lines, beautiful wood paneling and tonal design that has resulted in this one of a kind home. A study in the beauty of minimalist design, inspiration for the interior came from the work of sculptor, Donald Judd. Known for his sculptures and installations constructed out of industrial materials such as Plexiglas and concrete, Judd's work emphasized the purity of the objects. The homeowners, fans of Judd's work, have two of his desks in the space. Their design is echoed throughout the rest of the furnishings in the home, which are examples of the purity and shapes that the artist was known for. It's the scale of this space that immediately captures your attention. With towering ceilings and statement pieces like an oversized mantel in the living room, Tanksley worked in collaboration with architect James Dayton to bring in an array of textures and furnishings that would match the large scale and bring warmth to the interior. Pieces from companies known for their fine craftsmanship, like A. Rudin, Holly Hunt and Cliff Young fit this home perfectly. Tanksley, who loves to create destinations within interiors, designing rooms fit for large conversations, engaging groups, or time alone, has included a dining table that easily seats ten. It's fit for hosting large dinners with family and friends who are visiting. The space, which looks out on beautiful pine trees, is simply anchored by a large piece of 20th-century art and a canopy of lights overhead. The office is home to one of the sculptural desks by American artist, Donald Judd. His work, which was known to be installed in the interiors he designed, served as inspiration for Tanksley. The minimalist design of the office leaves room for the craftsmanship and artisanship of Judd's work to truly shine. A floor-to-ceiling window brings the outdoors in. A wonderful moment in this home, where natural elements like trees and a stream blend seamlessly with the calm interior environment. In the kitchen, a mix of wood and steel adds a modern feel to the space. Streamlined cabinetry leaves things feeling contemporary and refined. Blonde wood is a nice touch, allowing the kitchen to feel open and spacious in this mountain retreat. To keep the retreat feel going in the interior, Tanksley utilized a neutral color palette. A palette of cream, brown and amber is present in the guest bedroom suite, as well as the rest of the home. A set of blue side chairs add an unexpected dose of color in the space, though they don't stray too far from the natural palette, with the shade of blue reflecting the color of the sky peeking through the bedroom window. The bedroom suite continues into a cozy nook where guests can look out onto the beautiful mountains and trees of Vail, Colorado. The seating area points to Tanksley's goal of creating destinations in his interiors, from large spaces to gather to quiet nooks like this, perfect for times of introspection. The bathroom has some of the most modern elements in this contemporary interior. Gleaming white marble makes up the floor and vanity of the space. Stainless steel is the perfect accent to the stark white stone. A wall of mirrors is a beautiful finishing touch, reflecting a home surrounded by beautiful trees. The outdoors have been brought in to this dream home with wood paneling. In the hallway, a paneled wall becomes the perfect destination for party games at a bridge table. It's one more example of the cozy and unexpected nooks that Tanksley has carved out in this interior to create moments of intimacy for family and friends. The home's library houses the second Donald Judd desk. It's the perfect place to experience the sculptural design of Judd's furnishings. Surrounded by beautiful built-ins that are home to a burgeoning collection of books, the desk is the ultimate statement piece in this literary room.